Amid uncertainty over whether House Minority Leader Nancy Pelosi (D-Calif.) will be elected speaker next year despite a Democratic majority in the House, a group of 102 LGBT leaders have come out to “enthusiastically endorse” her to become presiding officer of the chamber. 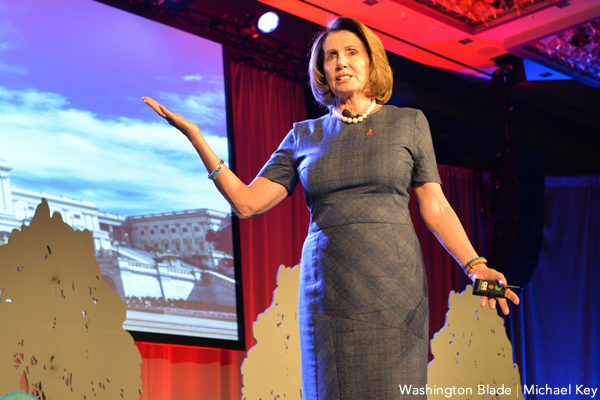 Pelosi has been a champion of the Equality Act, comprehensive LGBT rights legislation that would amend the Civil Rights Act of 1964 to include sexual orientation and gender identity, and has indicated advancing the measure would be a top priority with Democrats in control of the U.S. House. Pelosi’s election as speaker is in serious question as numerous members of the Democratic caucus have publicly stated they won’t vote her as presiding officer. Rep. Seth Moulton (D-Mass.) has said he’d support for the role Rep. Marcia Fudge (D-Ohio). (Fudge is one of two Democrats who in the last Congress wasn’t a co-sponsor of the Equality Act). Another signer of the joint statement in support of Pelosi is Arizona State Rep. Daniel Hernandez, who gained notoriety for saving the life of former U.S. Rep. Gabrielle Giffords in mass shooting in 2011.